The Archduke is a robust-bodied and relatively large butterfly. The species prefers the shady forested understorey of the nature reserves and is rarely, if ever, found in urban parks and gardens. When alarmed they fly very fast at low levels just a few feet above the forest floor typically and stop with their wings opened flat. 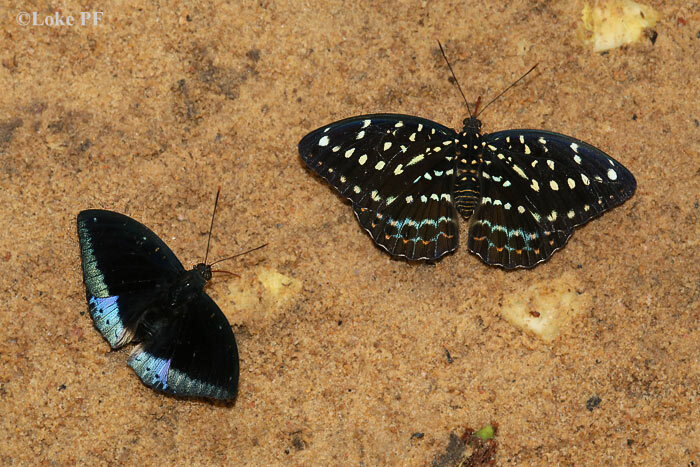 The Archduke displays sexual dimorphism (where the male and female of the species look very different). The Archduke is often encountered feeding on fallen rotting fruit on the forest floor or foraging amongst the damp leaf litter in search of nutrients. This shot, taken by ButterflyCircle member Loke PF, shows both the male (left) and the female feeding on rotting pineapple bait on the forest floor in the nature reserves.